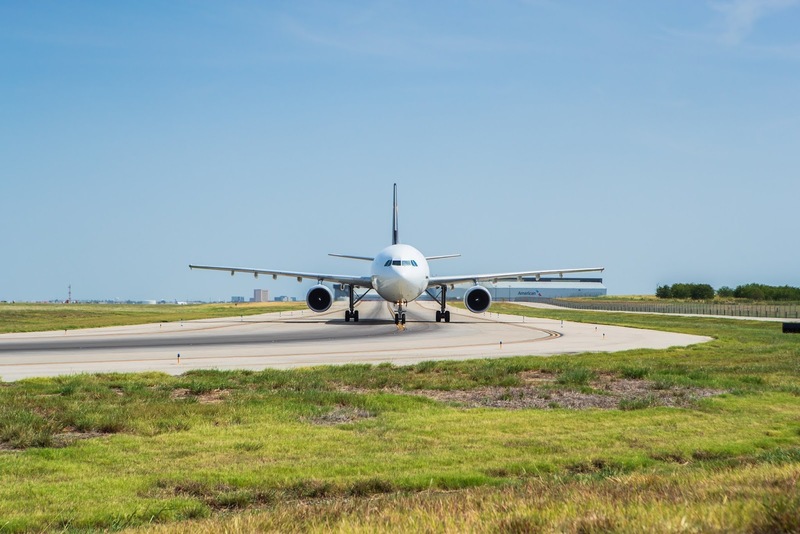 Dallas Fort Worth (DFW) International Airport today received a Letter of Intent from the Federal Aviation Administration (FAA) committing up to $180 million in Airport Improvement Program (AIP) grant funding for two end-around taxiway systems. U.S. Secretary of Transportation Elaine L. Chao delivered the Letter of Intent to the Airport in person, underscoring the importance of investing in airport infrastructure. "We're extremely grateful to the Department of Transportation and the Federal Aviation Administration. Our productive partnership continues to identify innovative solutions that benefit the biggest air traffic management system in the world," said Sean Donohue, CEO of Dallas Fort Worth International Airport. "Today's commitment of $180 million is further validation for the team from DFW, the FAA and NASA who designed the concept of end-around taxiways more than a decade ago. When we work together, we improve the safety and efficiency of the airfield and create more capacity on our runways, preparing us to better meet the growing demand for air travel in the United States." "This investment in two new taxiways at the Dallas-Fort Worth International Airport will help ensure more efficient movement of travellers and commercial goods through the fourth busiest airport in our nation," said U.S. Secretary of Transportation Elaine L. Chao. The next phase of the end-around taxiways is already under construction on DFW's northeast quadrant, with completion anticipated by 2021. DFW Airport's southwest quadrant taxiway is expected to be built by 2023. The federal funding included in the Letter of Intent could cover up to half of the overall cost of the next two phases. "In a global economy, infrastructure investment helps keep the Dallas Fort Worth region competitive," said Fort Worth Mayor Betsy Price. "One great way to do that is to make sure we get the most out of DFW Airport because it is vital to the transportation system of the United States and the world." "These funding commitments from the DOT and the FAA help make sure that DFW is ready for the future," said Dallas Mayor Mike Rawlings. "It's all about maintaining our infrastructure and investing now to keep our airport and our region ahead of growing demand for air travel." DFW opened its first end-around taxiway system on the southeast side of the Airport in 2008. End-around taxiways enable arriving aircraft to taxi around DFW's seven active runways rather than wait to cross them. The taxiways enhance safety because they virtually eliminate runway crossings, reducing the risk of possible incursions. End-around taxiways ultimately produce gains in runway efficiency and reduce overall taxi times for arriving aircraft. The taxiway projects are a key part of DFW's overall ten-year infrastructure improvement plan, which includes enhancing or rebuilding runways, roadways, bridges and other major infrastructure needs on the Airport grounds. Separately, Secretary Chao also delivered a $31 million AIP grant for the rehabilitation of Runway 17-C at the Airport. Construction on Runway 17-C is scheduled to be complete in 2019, with minimal disruption to customers.